Did Wicked Winter Beat Bad Blights? | Gardens Alive! Did Wicked Winter Beat Bad Blights? Q. Last year we didn't plant impatiens because of a disease that Mike warned us about. Does that hold for this year, too? A: Here's somebody who actually listened to my warning—and who wants to know the deal for this season. I better get it right! Yes; a disease known as "impatiens downy mildew" appeared a few years back and quickly wiped out the ordinary 'bedding plant' form of impatiens in gardens in a large swath of the country. One day the flowers were fine, the next day they were gone, and the day after that, the stalks had withered and died. I thought slugs or sun had gotten to mine until I heard people talking about a 'devastating disease'. Dr. Meg McGrath, a plant pathologist at Cornell, confirmed the scope and severity of the problem and said the best hope for a "cure" was for everyone simply not to grow impatiens for a few seasons. "Without a proper host," she explains, "the pathogen might just die off." And yes, even over THIS wretched winter. The heavy snow cover that most people experienced virtually all season provided superb insulation and protected the soil surface from the above-ground freezing temps. The "killing winters" for perennial plants—and some pathogens—are when it's severely cold with NO snow. So the mildew is still out there. Dr. Meg says that the LEAST that people can do is not plant impatiens anywhere near where impatiens have grown in recent years; same-spot plantings are certain to become infected. And when that happens, those plantings will breed new spores that will then travel great distances on the wind to infect other gardens. So the best answer is still not to plant that one type of impatiens. But it's not as if the regular bedding form of impatiens are the only flowers that flourish in shade. Dr. Meg suggests that gardeners "get out of the impatiens rut!" and grow begonias, coleus, Torenia (a very under-utilized flower) and other shade-tolerant ornamentals. Heck, they even still grow impatiens in the form of New Guinea impatiens, which sure look close to the same to me, but are not affected by the disease. If everyone gets with this program, the pathogen might well die off and we'll all be growing regular impatiens willy-nilly again in a few years. But people who knowingly plant the basic form of impatiens despite knowing that the disease is out there really do risk becoming a Typhoid Mary of the plant world. Q: Are there any tomato varieties that are less susceptible to late summer blight—where the leaves of the plants progressively turn yellow and brown from the bottom up? A. I picked this question to answer about the late blight situation because Tony makes an all-too common mistake. 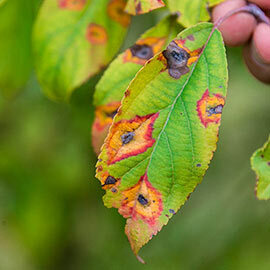 What he describes is NOT late blight, a truly dread disease that first appears as brown spots on both leaves and fruits, and that generally kills entire plants VERY quickly. It's caused by the same pathogen that led to "The Great Irish Potato Famine" of 1845, killing millions of my ancestors and leading to a constant migration out of Ireland that continued through my grandfather's time. I repeat: Late blight on tomatoes is the exact same pathogen that wiped out Ireland's potato crops, and potatoes are still key to the disease. Unlike the mildew that's troubling impatiens, the late blight pathogen can't survive any kind of winter above ground, but it can survive on potatoes left in the ground. That's why we've been telling people to destroy any 'volunteer' potato plants that pop up in their gardens and to only grow certified disease free seed potatoes. Unfortunately even if everyone did that, the blight would not come to an end. It's always active down in the warmest areas of Florida where tomatoes grow year-round, and the spores travel slowly up the coast as the weather warms every Summer. But destroying any 'volunteer' plants that sprout from potatoes you missed at harvest time last season would help make it a true 'late blight' in that it would at least show up pretty late in the season. No, late blight doesn't always show up 'late'. It's a dumb common name. Late Blight can appear early in the season, and Early Blight can show up late in the season. And gardeners have a bad habit of calling anything nasty that happens to their tomatoes a 'blight'—like Tony, whose problem is actually one of the soil-borne wilts that are inevitable if you grow tomatoes in the same place year after year. It's probably the most common tomato problem; and it's easily solved by following a three year rotation for tomatoes. Just grow tomatoes in a different spot every season, and by the third season you can go back and use that original planting spot again. In small-space gardens, it's also a good idea to grow at least some resistant varieties (designated by the letters VF after their variety name). And when you really want to grow specific varieties that aren't specifically resistant (like the old heirloom types), grafted plants—tasty tomatoes grafted onto a wilt-resistant rootstock—are a good option, again, especially for people with little or no space to rotate their tomatoes to. There aren't any grafted varieties that are resistant to late blight, because that disease is blowing in on the wind and not lurking in the soil, where a resistant root stock can try and, well—resist—it. But there are varieties that have been bred to resist the disease, with more being developed every year; they're just not grafted. Now, before we go, I have to mention that plant pathologists like Meg are also following two other nasty actors: A downy mildew that affects basil plants and one that infects cucumbers.